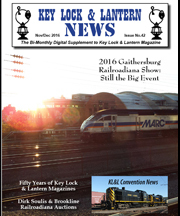 Key, Lock & Lantern 2017 Convention Update, 50 Years of KL&L Magazines, Dirk Soulis Auction, Fall Brookline Auction, Gaithersburg Transportation Memorabilia Show, KL&L Trustee Patti Gray, KL&L Meeting Notice, Want Ads & Railroad Event Calendar. 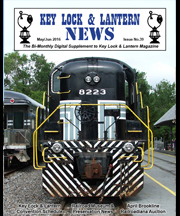 Key, Lock & Lantern 2017 Convention Announcement, Railroad Memories Auction, Last Run from Lake Placid, JW Auction Report, California State Railroad Museum Exhibit, Nashville Steam Locomotive Restoration, Want Ads & Railroad Event Calendar. 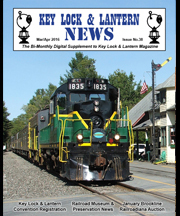 Key, Lock & Lantern Convention Report, Railroad Memories Auction, Beeliners in the Berkshires, Catskill Mountain & Adirondack Scenic RR News, California State Railroad Museum Seeks Volunteers, Railroad Historical Society Fall Conventions, Want Ads & Railroad Event Calendar. 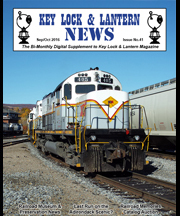 Key, Lock & Lantern Convention Schedule, April Brookline Railroadiana Auction, Albuquerque Railroad Fair, Adirondack Scenic RR, Farewell to the AEM7, Lantern Exhibit at California RR Museum, Membership renewals are now due, Want Ads & Railroad Event Calendar. 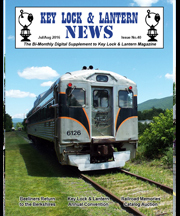 Key, Lock & Lantern Convention Registration, Brookline Railroadiana Auction, Adirondack Scenic RR Trip, N&W 611 Schedule, California RR Museum Excursions, New York Central Steam Engine Struck by Runaway Car, Want Ads & Railroad Event Calendar. 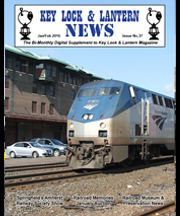 Amherst Railway Society Show, Railroad Memories Auction, KL&L Convention Info, Orange Empire Railway Museum Show, Alco Train Show, NYCSHS Convention, Harris Tower & Train Show, Reading 2102 Restoration, Want Ads & Railroad Event Calendar.